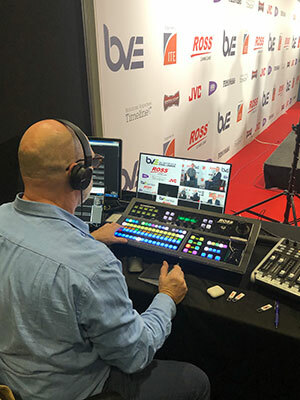 We tend to meet up throughout the year at BVE, NAB and IBC, how was 2018 for you? Generally speaking, we were in an incredibly fortunate situation last year, it was a fantastic year for us and we’re certainly not taking that for granted. In EMEA, the company grew by 27%, with healthy overall global growth meaning that we’ve now had 27 years of consecutive growth. On average its been about 17% every year so, again, we’re starting from different base lines in different parts of the world, and I always make the point that outside of North America we’re not as well-known as we would like to be, but we’re trying to go out to the market with some very positive messages and I think people are picking up on that. We managed to win some important business last year around the world with some very well-known customer names. I think when we do take on new customers at Ross, we don’t tend to lose many and that’s a testament to the quality of tech support and customer service that we give them. So last year was fantastic. Ross have been around for a while, you get involved in lots of different areas. What sort of trends have you noticed recently in this industry? So looking forward, if you had to pick one what would you say is your theme for 2019? Well we started talking this year about high impact and high efficiency production and we’ve had a number of different conversations with customers recently where the themes of value and efficiency have bubbled up to the surface very quickly. This is something our senior management came up with towards the end of last year and I like the idea of being able to go out into the market with a very simple message, it doesn’t matter your size or your scale, it doesn’t matter what type of content you are producing, ROSS can help you to deliver the high impact and efficiency that you want because value is important. We’re all having to do more with less in the industry and we’re all seeking to get as many efficiencies as we can so a focus on how we can really improve efficiencies and save money along the way as well as keeping peoples blood pressure down at a certain level are key! One of our customers said something quite compelling, they said they wanted to get more live content back into their schedule because live is the fun and exciting end of the market but the concern was the cost. Live tends to be more costly and can be unpredictable as well and he said one of the reasons he has enjoyed working with us so much is that we have enabled him to get more live content into the schedule, but very cost effectively, he’s being more creative but not having to spend more money and then the end result is better to look at. Well we are here at BVE and there is a lot of kit around us, Ross have a massive portfolio! Anything new and exciting we can look forward to? I always have to take a very deep breath before we get to NAB. I think last year the senior management team were trying to kill me because we went into NAB with I think about 16 new products and it was about 11 or12 for IBC, we’re trying to stretch things out a little bit and balance the new product introductions and we launched a very important product at last year at CABSAT and I think we may well have a couple of interesting things to unveil, but the only thing I can say for certain is that there will be a lot of stuff from us, there always is and a lot of that will be brand new. I have a working list in my head, which I won’t share with you now but we were 28/29 products over the course of last year, I don’t see any reason why it would be less this year.